BELO HORIZONTE, Minas Gerais, Brazil, December 24, 2013 (ENS) – A new species of tapir, a mammal considered to be endangered or vulnerable, has been identified by scientists in the Amazon rainforest in parts of Brazil and Colombia. It is the smallest of the five known species of living tapirs. It is the first tapir discovery since 1865 and the first time in 100 years that a new species has been found in the order Perissodactyla, which includes tapirs, rhinos, and horses. An article in the current issue of the “Journal of Mammalogy” reports on this discovery. Using the largest geographic sample to date of a related species, the authors provide physical and DNA evidence to support their proposal that the tapirs be classified as a new species, Tapirus kabomani. To determine the uniqueness of T. kabomani, the authors examined skull, tissue, and DNA samples and measurements. Its skull differs in shape and features from those of all other living tapirs. T. kabomani differs from the other tapir species found in its range, having darker hair, a lower mane, and a broader forehead than Tapirus terrestris. It weighs about 240 pounds, measures just over four feet in length and three feet high at the shoulder, and it has shorter limbs than all other living, and several extinct, tapir species. Genetic studies also showed distinct results for T. kabomani. The first known specimen collected for this species of tapir remained unidentified for almost 100 years. The collector was Theodore Roosevelt, who was President of the United States from 1901–1909. Roosevelt sent the specimen to the American Museum of Natural History in New York City for analysis, but it was considered just a variation of T. terrestris (Allen 1914). 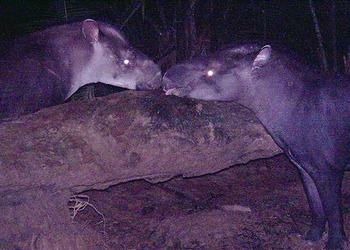 Tapirs currently live in Southeast Asia and Central and South America. Historically, these mammals roamed a wide geographic range, but today’s tapir species are isolated from one another and are suffering from overhunting and habitat destruction. 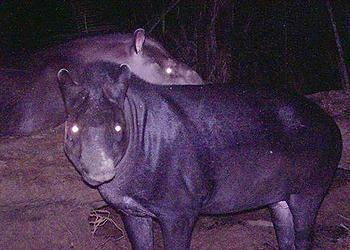 The discovery of T. kabomani means that there are now five known living species of tapirs. Although this is the first time T. kabomani has been named scientifically, local people have long known of the species’ existence. They rely on the animals for food and give them a place in their cultural traditions. The authors report that they and locals have seen significant evidence of this species in grassland and forest habitats, but few tapirs have been seen in areas of pure forest or open ground. They warn that increasing human population, decreasing forested land, and widespread development in the Amazon could affect the new species. American tapir specialist Craig Downer, a member of the IUCN Species Survival Commission’s Tapir Specialist Group, and a member of the American Society of Mammalogists who publish the “Journal of Mammalogy,” had heard of the new species from local guides during his studies in the Andes. “In my extensive study of the endangered Mountain Tapir, Tapirus pinchaque, from time to time I frequented the eastern foothills regions of the Andes bordering on the Amazonian region over a period of years dating from 1978 to 2003. I found evidence of the Mountain Tapir descending to as low as 1,300 meters elevation above sea level, particularly to visit favored mineral springs, but also to obtain needed forage,” Downer told ENS in an email interview. “In several of these areas, my local guides, including tribal members, would inform me that they knew of another type of tapir that was neither the Lowland Tapir, Tapirus terrestris, nor the Mountain Tapir,” he said. “I thought that this might be a hybrid between the two species and included their observations in some of my reports. One such area was the Rio Cofanes in northern Ecuador and bordering on Colombia, where I made several expeditions during my mountain tapir studies in the late 1990s,” said Downer. Downer urges that conservation measures to protect the new species be taken at once because it is probably in danger of extinction. “It is very probable that it is in critical danger of extinction and needs to be so classified by the IUCN Species Survival Commission’s Tapir Specialist Group as well as the national governments where it occurs: Colombia, Ecuador, Peru, Brazil, and possibly others such as Venezuela and Bolivia,” he said. The authors of the original article in the “Journal of Mammology” also urge immediate conservation of the newly discovered tapir’s habitat.